Viola was born (as a double Pisces) and raised in New York and had many instances of paranormal occurrences growing up, but nothing to indicate the spiritual life path that was to be, that is, until a life-changing event. On New Year's Eve 1989, while living in St. Louis, Viola was hit by a drunk driver when jogging and thrown 122 feet. Major injuries were incurred, including a vertebra break, severe leg damage, and head trauma. She overheard doctors talking outside the emergency room about how she shouldn't be alive. The prognosis was that she would be in the hospital for weeks, in a back brace for six months, and considerable physical therapy would be required. What actually happened was that she was out of the hospital in three days, wore the back brace for two weeks, did a couple of rehab sessions, then ran a marathon that September! Three weeks after being hit, a friend raved about a psychic she had just visited and suggested Viola get a reading from her. It had been many years since Viola had gotten a reading, and because she felt changes in her self taking place, she made an appointment. The psychic had no knowledge of the accident but told Viola that there had been a miraculous healing of body and shift in spirit. She encouraged Viola to develop her abilities and follow the new life path that was opening up. Viola wholeheartedly did by studying with that psychic, taking classes from others, and reading voraciously about metaphysics and spirituality. By 1995, Viola moved to New Mexico and opened a metaphysical shop called Visions By Viola, which she owned and operated for almost nine years. Viola currently lives in the mountains of northern New Mexico with her husband, 3 canine kids, and a chicken named Bobbi. This book is the bible for creating, expanding, and maintaining a successful and profitable spiritually-based business. It’s the product of an unsatisfying search for practical professional advice about how and where to begin establishing, then to grow, and ultimately to earn a comfortable living being a professional psychic. It’s a comprehensive guide applicable for a budding psychic to go into business for themselves and it’s filled with meaty, real-world, pertinent-to-psychics business advice for working psychic counselors who struggle to make a good enough living, let alone quit their day jobs—even when they have “all the right stuff.” This book is also relevant for those who already have an established practice, but who wish to expand their business, their clientele, as well as their incomes. 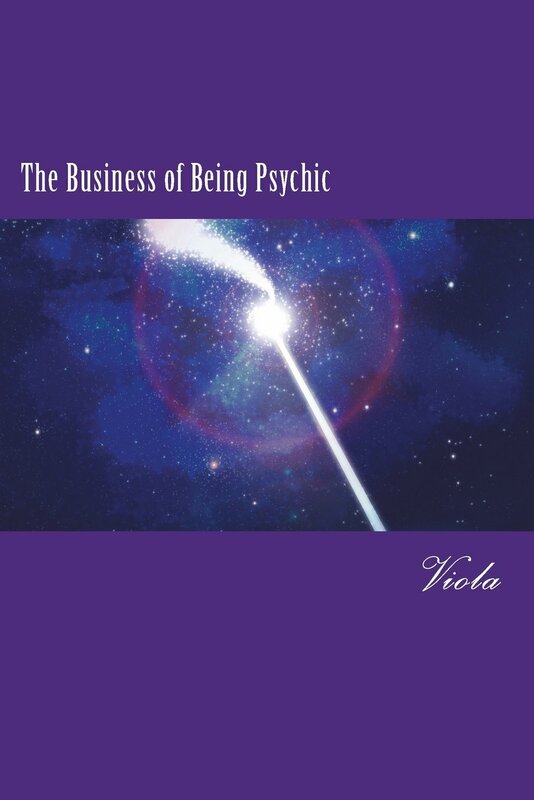 In The Business of Being Psychic, Viola offers tangible business know-how for an intangible business product. Viola shares, in a funnily conversational manner, many personal experiences—the good, the bad, and the ugly—that show how she learned the hard way how to build a psychic counseling practice. With almost 30 years of experiences, she’s more than qualified to give much tried-and-true advice. This is a book about what she’s learned over the years on how to build a good, solid practice that is rewarding, sustainable, and ever-expanding. Although focused on professional psychics, the insight offered in this book is not limited to psychics. Anyone who engages with others in personal and intimate ways—energy workers, healers, psychologists, life coaches, therapists, etc.—will glean much about their own professional practices. Available from Amazon and Kindle. "How Not To Do A Psychic Reading" is a channeled work (and that's not a word Viola uses lightly). She takes credit completely for being the vehicle for it, as well as doing all the manual labor involved. Running is her meditation, when lots of messages, answers, insights, and inspirations come. For months during her morning runs, bits and pieces, along with much urging from her Guides to write this book, kept coming to her. During a conversation with a friend one night Viola confided that she was thinking about writing a book about what shouldn't be done with respect to doing readings, basically because the bombardment wasn't going away and, frankly, no such information or guidelines were out there. So, having said it out loud to her friend and Spirit, she "just happened" to get snowed in the very next day which provided her the time to sit with pen and pad. For seven hours the outline and the essence of the book flowed. It is a great little gem of wisdom which provides guidance for conduct, caring, and professionalism for anyone and everyone spiritually interacting with another person. It is extremely pertinent to readers because there are a myriad of books & workshops on how to do a reading, what to read with, etc., but nothing about what faux pas should and could be avoided. It is especially beneficial for metaphysical shop owners who have in-house or guest psychics. How that person conducts themselves is a direct reflection on that store and its reputation. It is also a great tool for anyone getting a reading because it can ensure that their reader is coming from a place of integrity and has their best interests at heart. The information in the book is imparted in a very conversational & humorous manner. How Not To Do A Psychic Reading has been named a finalist for the 2007 New Mexico Book Awards Best New Age book. Viola has been doing intuitive readings since 1992. She is clairaudient (hears), clairsentient (feels), and clairvoyant (sees). She incorporates numerology and astrology in sessions, and uses Rune cards as her focus. Viola connects in with her client's energy and guides and imparts information that the person needs to know. What they want to know does not always come up immediately, but what they need to hear and heed is absolutely guaranteed! Readings are $80 per half hour. I am a massage therapist and teacher in Houston, Texas. I received my first reading from Viola in 2004 when I was taking care of my father who had Alzheimer's disease. During my reading, Viola told me when my responsibility with my father would end. Years later, I ran across my notes from the reading and she was exactly right. My career is currently taking a new direction in teaching and I consult with Viola to make sure I am headed in the right direction. I even refer to her book in my classes. I love her book because it is very simple and basic information that everyone needs to know and apply. It is not just for the Psychic but for anyone who works in the service industry; i.e, massage therapists, Reiki Masters, doctors, dentists, acupuncturists, aromatherapists, etc. can and should apply the steps outlined in her book. Viola is a great comfort and counselor in both my personal and business life. I highly recommend her. Whenever I'm approached by a customer who's considering a psychic reading with Viola for the first time and they ask, "Is she any good?" I reply, "She wouldn't be here if she wasn't good!". Then I'll share a few of my own experiences with her... recalling the beginnings of our sessions, as she would sit calmly with her eyes closed for a minute or so, and then ask me the most obtuse yet amazingly accurate of questions from: "Does your water heater need to be replaced?" or "Is there an unfinished painting project in your bathroom?" to " Are you and your mother not getting along right now?" to which the answer is always "Yes!". Viola has an uncanny ability to identify and highlight the areas of our lives and our surroundings that need our attention. In quiet observation, with the help of her intuitive guides, she tunes in to the sights and sounds of our aural realm. The Rune cards and angel cards she uses function more as guideposts and confirmation for her clairaudient, clairvoyant, and clairsentient interpretations. She surveys body, temperament and soul, and sometimes suggests a course of action or recommends a therapy that subconsciously we have either neglected or forgotten for ourselves. Her messages at times can be stern yet sensitive, somber or sunny. A reading from Viola may not say what you want to hear at the time, but it's the information you'll need to help you make informed decisions and to move forward in your life. Keep an open mind...something may fall in! I am a business owner from San Antonio, Texas. I had the good fortune to meet an amazing woman named Viola about 5 years ago. This awesome lady has truly been blessed with the gift of psychic ability. Viola has proven herself time and time again with consistent & accurate predictions regarding my corporate as well as my personal life. I would challenge any person to just once try this unique experience. The results will speak for themselves. Because of the results I have attained with my readings, I now consider Viola an integral part of my decision making process. As a business person Viola’s insightful predictions have been invaluable to me. When running a business, having the inside track on hiring employees, dealing with clients, & even equipment repairs has many advantages. Viola is now considered not only my advisor, consultant, confident, but also my friend. My personal opinion is that she has been sent to Earth from Heaven above to show us all that there is something else beyond this earthly realm. The gifted psychic reader, Viola, is in my opinion, one of the finest readers in New Mexico. Her abilities to delve into the very souls of her clients and foresee all that await them is unsurpassed. I have produced multiple large metaphysical fairs and am a part owner of a metaphysical shop that has utilized Viola's phenomenal gift to serve the metaphysical community in the central Rio Grande valley. Always, she has risen above the rest in her trade, to truly assert herself as one of the best in reading skill and professionalism.